Verdi’s opera “La Traviata” premiered at the Teatro La Fenice in Venice on the 6th of March 1853. It was not a success, but since that time it has become one of the most-performed and best-loved operas. 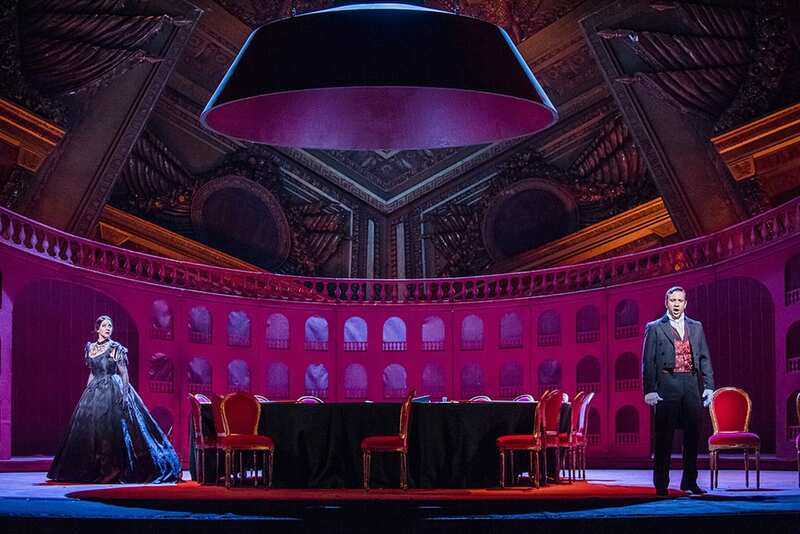 In this revival by the Royal Opera House of Richard Eyre’s no-nonesense 1994 production the sets (designed by Bob Crowley) are at once realistic and symbolic; we are in a definite time period dominated by over-size shutters and top-heavy gilt cornices. The scenery becomes part of the emotional landscape. After a slightly dragging tempo during the prelude from conductor Daniele Rustioni the curtain goes up on a (musically) fizzing Act One. The staging feels cramped (especially with the crush of all those chorus crinolines) and the party tame, but there are some nice visual touches (the big double doors closing to shut out the sound of the offstage band, the shadows of dancers in the background). The sense is of walls closing in on Violetta; claustrophobia. Is Violetta truly free as a lady of pleasure? She seems trapped in a round wooden box. Lebanese/Canadian soprano Joyce El-Khoury (Violetta) has a flexible voice which is occasionally shrill, and now and again bleating, but with an impressive ability to sing high mezza di voce. Her interpretive choices are often fresh and insightful; this is the case with her end-of-act scena in the first Act – sung with less of the conventional sparkle, self-confidence and superficiality, pleasure is sung of with distaste; the second verse of “Sempre Libera” is sung in almost a whisper – Violetta’s fear of the unknown yet to come tangible in every syllable. 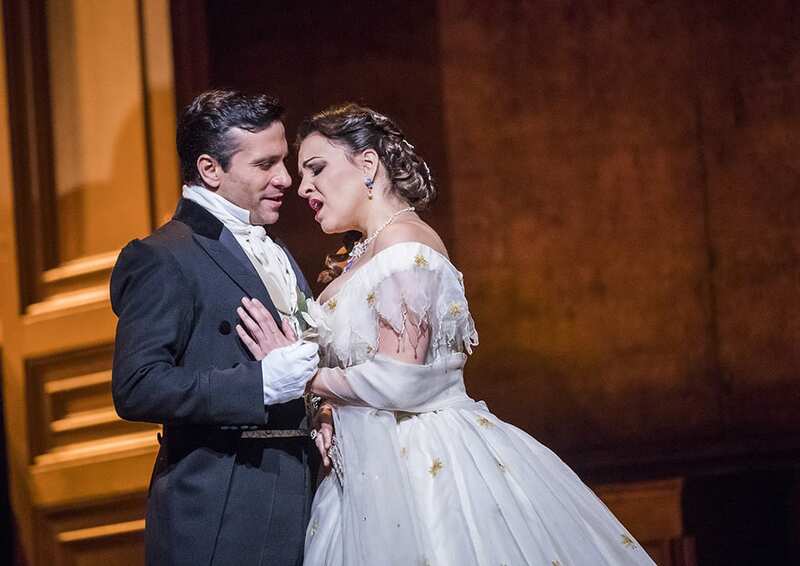 In La Traviata Verdi achieves a flow of music and drama which feels fresh more than a century and a half after it was written. 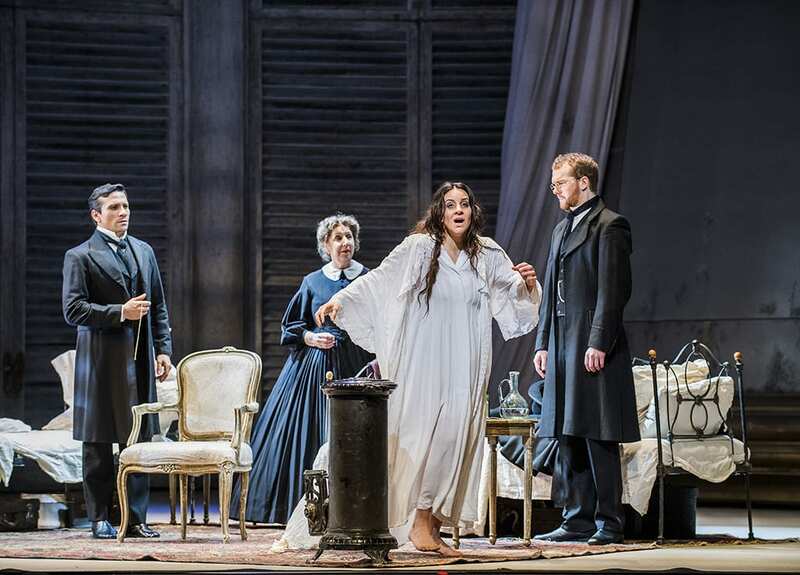 Only a few moments break the dramatic flow – Alfredo’s Act Two aria and cabaletta (well sung by Romanovsky with a hint of vocal fatigue in the cabaletta) are examples of this – they are perfunctory and unconvincing. The character of Alfredo is uninteresting when he is not singing to (or with) Violetta. 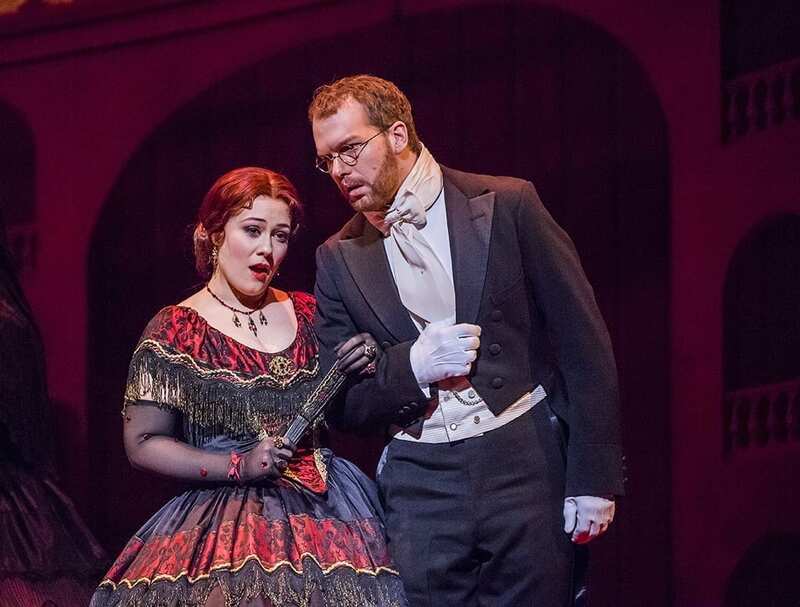 Romanovsky across the evening had a handsome sound, with nerves getting the better of him in the opening scene, resulting in a fast-beating, fine-grained vibrato when singing quietly. This evens out as the evening goes on. His duets with El-Khoury are gorgeous. 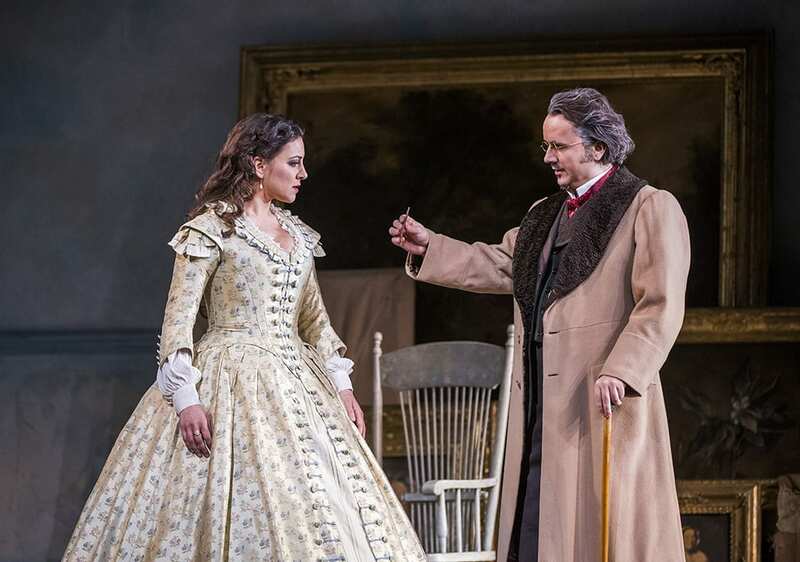 As Giorgio Germont baritone Artur Ruciński spins out long phrases with ample breath to support them, although he seems a little young to be Alfredo’s father (more like his older brother). The party scene at the house of Flora Bervoix (Angela Simkin), during which Alfredo denounces Violetta, is taut and thrilling. The choice of tempi (slowing a bit for Violetta’s simple, rising, lyrical line, gathering pace again as our attention returns to the game of cards being played at the gaming table) combined with fine singing from the soloists and chorus during the concertante to great effect. At one point Violetta is spotlighted alone in the shadow of an oppressive, massive lamp (lighting design by Jean Kalman), dressed in black with her hair austerely tied back; she is isolated from all onstage and this great shadow hanging over her is like a portent of her approaching demise. In the final act the curtain goes up on an austere wall of huge shutters like rib cages; the bare ribs of a crinoline standing to one side. The colour and opulence of the preceding acts is drained from the stage. 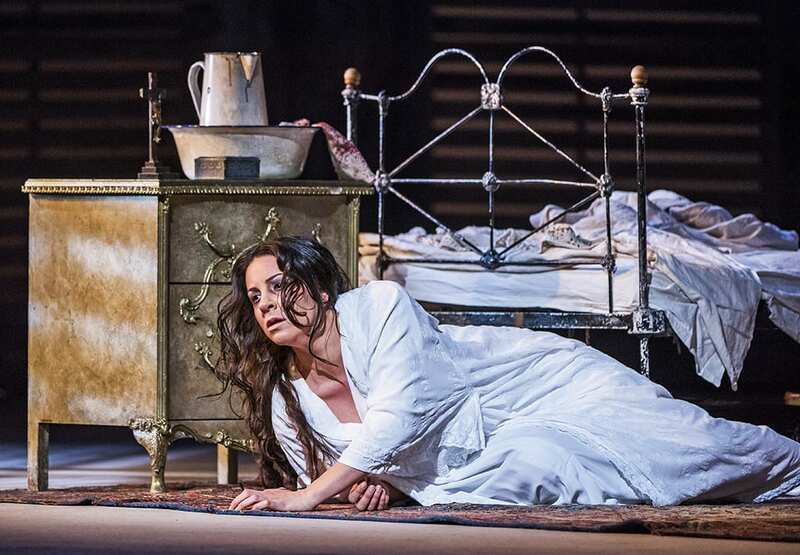 Death is in the design and Violetta is on a blood-stained bed, fading away. El-Khoury’s “Addio del passato” is phenomenal, the final dying phrases sung lying on the floor, the notes floating but secure; a sense of Violetta’s body and soul beginning to part company. Offstage revellers (seen in flitting shadows on the shutters, dancing – a reminiscence of Act One) sing a trivial carnival song. The sublime and the ridiculous side by side, the light and shade powerful reminders of how close death is to life. Born in the North of England, Andrew studied acting at the Waterfront Theatre School in Cape Town, before returning to the UK to study opera performance at Birkbeck College in 2000. He has sung small roles in operas by Verdi and Menotti and works full-time as a puppeteer. He has written reviews for Opera Talent, PuppeteersUK and Theatre Full Stop.